The consideration of a new program of cooperation with Ukraine by the Executive Board of the International Monetary Fund (IMF) is possible after the Verkhovna Rada approves the national budget for 2019, Communications Department Director at the IMF Gerry Rice has reported. 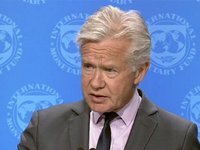 "The status is that the authorities are now working on the implementation of the prior actions needed for that program to go forward toward approval by our Executive Board," he said during a traditional briefing in Washington, D.C.
"And in this regard a small IMF team visited Kyiv last week to assist with the necessary preparations in line with that SLA (service level agreement). At the moment we would expect Executive Board consideration later this year following the implementation of those prior actions relating to the parliamentary approval of the 2019 budget and an increase in heating tariffs in line with the agreement that were reached," the official stated. "Beyond what we spelled out in our statement on October 19, I don't have anything further on that. It talked about building on the progress made on the macroeconomic front, focusing on the fiscal consolidation," he added.